Who Owns What in the Genealogy World? Artifacts, whether found in museums, our community, our our homes, offer glimpses into the past. Be they documents, photographs, books, or clothing, as custodians of our history, we are faced with how to maintain these items. 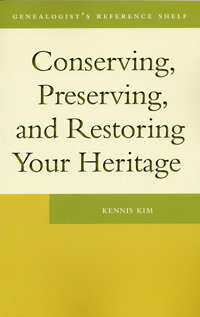 Professional conservator Kennis Kim tells us how in this book. Topics discussed include: creating an accession list; the nature of conservation, restoration and preservation; deciding on display, storage or using the artifact; common threats such as light, humidity, insects and rodents; and when to call in professional. Here is all you need to determine what can be done to preserve precious articles for future generations. Get Ready for South Australia’s 2019 History Festival?